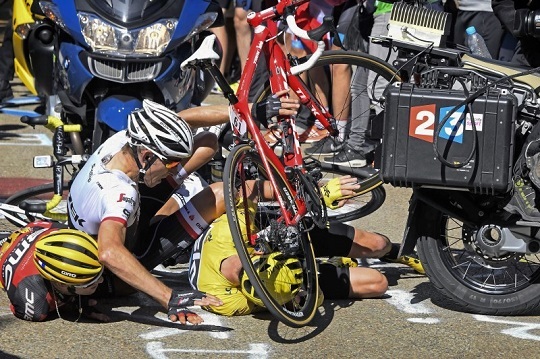 Our new friend Tejay Van Garderen, native of Tacoma, Washington, has acquitted himself well thus far, currently standing in 8th place, 4'47" behind Froome as the riders prepare to enter the Swiss Alps. Over the last couple of days, the riders have been in and around the Rhone Valley, one of the more productive -- yet strangely overlooked by many American wine consumers -- wine regions in France. The Rhone Valley is roughly divided into north and south sections by the River Drôme. The climate in the northern Rhone tends to be cooler than the south. The only red grape grown in the northern Rhone is Syrah. Viognier, Marsanne, and Roussane are grown for whites. In the South, Grenache is the major grape of choice, although Syrah, Mourvèdre, Carignan and Cinsault are often included in red blends. Whites include Ugni blanc, Roussanne, Bourboulenc, Picpoul, Clairette and, in recent years, Viognier. The Rhone's most famous wine is Chateauneuf-de-Pape, grown in the south. The north produces such yummies as Côte Rotie, Croze-Hermitage, Hermitage, and Condrieu -- the last being an expensive white made from Viognier. However, for our purposes, most of the wines you'll see from the region will be labeled Cotes-du-Rhone. "Côtes-du-Rhone" (pronounced "Coat dew roan" as if you have a stuffy nose) can be made from grapes grown anywhere within the region. Reds labeled as such must contain at least 40% Grenache. The remaining 60% will be largely a blend of the red grapes we've already mentioned. The south produces 80% of the wine, so most of the wines you see labeled "Côtes-du-Rhone" are going to be from the south and will be dominated by Grenache, sometimes as a single varietal. Côtes-du-Rhone cranks out a lot of very good, very approachable red wine. These wines tend to be drunk young -- within five years of bottling. These reds tend to be medium bodied with lots of cherry and dark berry flavors. The "old world funk"/earthiness classic to many French reds is usually there to some extent -- but not as powerfully as in many Bordeaux. Even so, these are usually great wines to go with anything earthy or sausagey -- or even just to uncork and pass around. The main issue with CdR is that the quality can be all over the place. Because there's such a broad variety in the various blends, finding a consistent CdR can be a challenge. The flipside is that, with a little research, one can find a CdR that fits almost any palate. Ask your friendly wine store person for assistance. 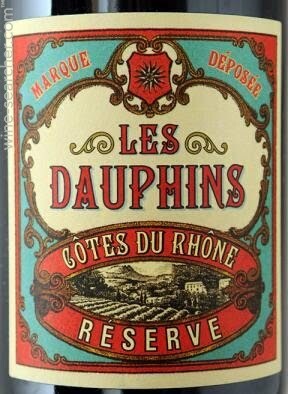 I had the chance to try the Les Dauphins 2013 Cotes du Rhone Reserve Rouge recently. It's a straightforward, bold red with a nose of cherries and other dark fruit. I got a burst of fruit at the first sip, but that yields fairly quickly to a mild flavor of tannin and graphite. Finish is softly tannic, although the tannin builds after a few sips. I thought it was a pretty solid red wine for almost all occasions. You could put this up against barbecue chicken or pork or grilled steak and veggies and do quite well. It retails for about $13, which is around the price you'll find many CdR. I mentioned that there are also whites in this region, although they are fewer and farther between. 80% of the blends of those wines have to be made up of the above varietals. 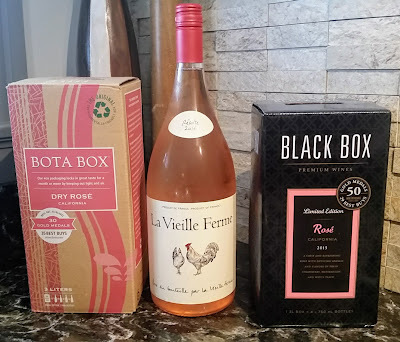 These wines tend to be medium bodied and food friendly, especially as an aperitif with appetizers. One example is the M.Chapoutier 2014 “Belleruche” Cotes-du-Rhone Blanc, a blend of Grenache Blanc, Clairette and Bourboulenc, which started me out with a nose of pineapple and a little wood. The body was medium weight with a nice creaminess. I thought it was interestingly complex for the price point ($12-13) with tropical fruit flavors backed with a gentle acidity. Its finish is fairly long and somewhat tart. An interesting change of pace for your table.